What are the advantages of using DIY Packs ? Our DIY timber packs are designed for maximum convenience and choice. Off the shelf, shrink-wrapped and rack displayed, packs are available in a choice of finishes and choice of timbers. 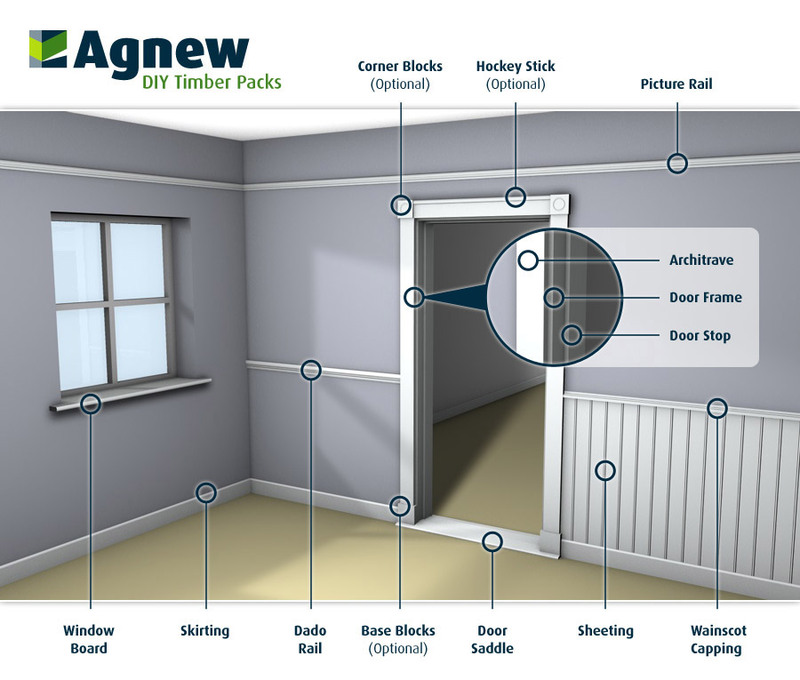 Are Agnew’s timber packs made from solid timber ? Our exclusive use of natural timber is a feature of all our products. The use of our natural wood products can help sustain the natural environment and enrich the appearance of your home. What does pre-primed mean ? Agnew Pre-Primed wood is coated on three sides using the latest technology, including an automated, computer-controlled coating and drying system to give a fabulous finish. A sealing/priming coat is followed by mechanical sanding, and gentle warm air-drying ensures the consistently perfect finish in a neutral off-white colour. The wood is ready to receive a finishing top coat of either gloss or emulsion paint and can be painted to compliment any colour scheme. What does pre-varnished mean ? Agnew Pre-Varnished ready to fit wood is ready to fit which makes installation clean and quick, resulting in minimal disruption to your family and lifestyle, as there is no dust from sanding or intoxicating fumes from chemicals such as lacquer. It has the added benefit of surface protection to ensure superior surface durability and wear resistance. Pre-finished solid timber is an excellent choice for those who want a shorter installation time and lower costs than unfinished wood. What does pre-stained mean ? Installation of our pre-stained products is clean and quick, causing minimal disruption to your family and lifestyle as there is no dust from sanding or intoxicating fumes from chemicals such as lacquer. It has the added benefit of surface protection to ensure superior surface durability and wear resistance. Pre-finished solid timber is an excellent choice for those who want a shorter installation time and lower costs than unfinished wood. Increasingly, customers are showing a preference for pre-finished product, stained and lacquered, and available ‘off-the-shelf’, instead of having to purchase the raw product and finish it themselves. This follows a parallel trend with the flooring market, and makes mouldings quicker and easier to install by removing the need for finishing the material on site. With the choice of packs available how I can I tell them apart ? Are there different profiles available ? We provide a large range of decorative moulding profiles – skillfully milled to enhance the natural grain pattern of wood. Our moulding profiles range from contemporary to traditional and in special orders we can create a style that reflects your individual needs and tastes. We invite you to take a look at our moulding profiles on the individual product pages, and keep in mind we also do custom mouldings. Feel free to request a quote, and order anytime you’d like. If you have any questions, please email us. Are your products sustainable ? Timber is a sustainable resource that brings an earthy and comforting feel to the indoor environment. As a building material, wood has the lowest energy consumption and the lowest CO2 emission of any commonly used material. Wood products continue to act as a carbon sink throughout their life. Timber has proven to be particularly energy efficient in use, and as such plays a major role in combating global warming. We work in partnership with carefully selected mills to maintain the high standard of quality and consistency that our customers have come to expect – this is achieved by sourcing only quality timber from Finland mainly. Our investment in bespoke software stock control provides traceability from supply to delivery.